Glass can have a certain level of surface defects. 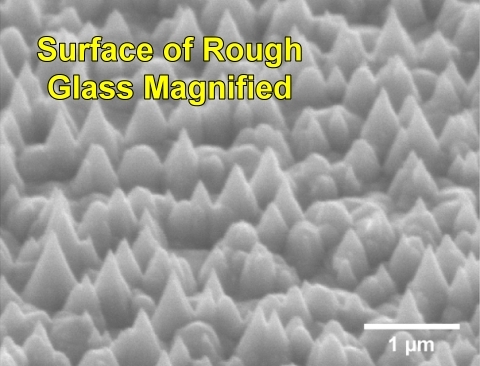 Some glass surfaces are rough; microscopically they have peaks and valleys. This type of problem glass is more susceptible to hard water spots and dirt; you can have two window panes side by side with equal amounts of hard water spots but the one on the right is much easier to remove because the glass surface is smooth. To make matters worse, small particles of metal and silica sand are sometimes embedded into this problem glass from the manufacturing process. These particles are often too small to be seen and during the hard water removal process these particles can become dislodged. Once these particles are dislodged they can scratch the glass due to the repetitive buffing that is necessary for glass restoration. Knowledge and experience are of the utmost importance during this process. This type of glass is found in all types of homes from the multimillion dollar to the everyday track home. In order to clean this type of glass you must be very skilled with the use of a squeegee. See our page on Pain with Double Pane for more information on problem glass.